134 pages | 1 B/W Illus. In trying to juggle the various priorities of doctoral study, many individuals struggle. From gathering data, preparing papers and organising projects, to the less obvious difficulties of time management and personal development, doctoral researchers are heavily tasked. In addition to this, those undertaking practitioner research face the complication of negotiating a less traditional research setting. As a guide to this ongoing, often neglected aspect of doctoral research, the authors of this innovative book explore in detail the challenges faced by doctoral researchers conducting practitioner research today. They show that the special nature of this research and the conditions in which the professional researcher works raise questions about producing new knowledge at work through research. This affects everything: relationships with practice; ethics; the ways that they are taught and supervised; the genre of the thesis; all place practitioners in situations which may not methodologically align with conventional approaches. 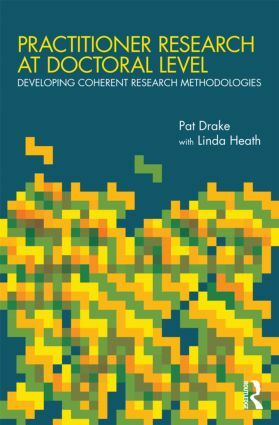 In this book the authors take the opportunity to explore these themes in an holistic and integrated way in order to develop a sense of methodological coherence for the practitioner researcher at doctoral level. In doing so, the authors argue for what is possible, suggesting that universities should critically examine practitioner doctorates to accommodate new forms of knowledge formation. As an invaluable guide through doctoral research, this book will be essential reading for both doctoral researchers and supervisors alike, as well as practitioner researchers working in professional settings more generally and those engaging in policy debates about doctoral research. 1. Introduction 2. Professional doctorates. What are professional doctorates? Who undertakes practitioner research at doctoral level? The production of knowledge on a doctorate. 3. Relationship between doctoral research and professional life. Power and professional settings. Inhabiting the hyphens. Becoming practitioner-researcher. 4. Approaching grounded methodology. Methodological attitude to enquiry. What does validity mean in practitioner research? Putting oneself in the frame. Becoming reflexive. 5. Thinking about ethical considerations. Background to ethical processes. Professional ethics. Research ethics. Situational ethics and complications for insider researchers. 6. What does doctoral pedagogy bring to practitioner research? Researcher identity. Expanded learning and constructing new knowledge. Learning and work. What does learning to do research entail? 7. The shaping of doctoral knowledge and supervision. Aligning of academic and professional knowledge. Supervisors’ academic and professional knowledge and experience. Perceptions of professional doctorates and impact on supervision. Training of supervisors and training for supervisors. Implications for supervision of expanded higher education. 8. Impact of doctoral research and researcher identity. What is a research degree for? Impact and public service policy. Universities claims. Impact in relation to practice. Shaping researcher identity. 9. Integrating academic and professional knowledge. Creating new knowledge. Becoming author. Writing reflexivity. Pat Drake is Senior Lecturer in Education at the University of Sussex, UK. Linda Heath is Senior Lecturer in the Business School at the University of Brighton, UK.